Home » All white goods Articles » Washing Machines » DIY Washing Machine Repair Help » How does a washing machine door interlock work? Understanding how a door interlock works helps in deciding if one is faulty or not. When you shut the door, the latch on the door pushes inside the door lock and activates an electrical part inside which locks the door shut. At the same time, power is passed through the interlock on to the rest of the machine. The actual latching shut of the door is a simple spring-loaded mechanism where the latch just slips into the door catch and the door stays closed. Locking the door is a separate process. How do washing machines lock the door? Locking the door so it can’t be opened whilst the washer is running is usually achieved using a bi-metal part inside the interlock. I’ve been repairing washing machines for over 30 years and seen many different types of interlock some of which do not use a bi-metal device at all. Some (e.g. some old Hotpoint washing machines) had a more sophisticated system that only locked the door when the motor was running and/or there was water inside. It achieved this using a pneumatic device (discussed in part 2). However, the majority of washing machines just use a bi-metal strip inside the door lock, which is cheap and effective. How does a bi-metal device work? Two different types of metal with different properties are combined on top of each other. 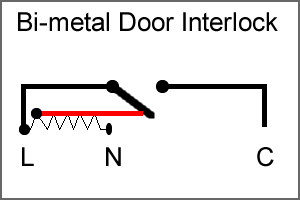 When the door is closed, a connection inside the lock powers an electrical coil wrapped round the bi metal part. This heats up the metal, which then bends. This bending operates the lock and then makes another electrical connection passing power to the rest of the machine. Once power is turned off, the metal strip cools down after a minute or two and straightens back up again releasing the door. In this rudimentary diagram you can see how the description above looks. The red line represents the bi-metal strip and the zig zagged lines between the live and neutral are the coil. Power activates the coil, which heats up the bi-metal part, this then physically bends and pushes the switch to the on position (as well as mechanically locking the door shut). Once this has happened (usually a second or so) power can run around to the common wire at the end, and therefore on to the rest of the machine allowing it to start. Note: Do not assume anything about the wire connections. They may be in totally different positions on different machines. Unless the connections are marked Live Neutral and Common you would need to work it all out with a continuity test meter. If you get the wires the wrong way round you can blow the device. It may be possible for a fourth wire on some variants to carry power to an LED which may indicate that the door is closed and the interlock activated. How can you tell if a door interlock is faulty? There isn’t a simple test, although you may be able to get a resistance reading between the live and neutral which should measure the small coil. You might expect to get a resistance reading of something like 1000 Ohm. As with most fault diagnosis it’s mostly a matter of the process of elimination, observation and previous experience. But as my opening paragraph states, if you understand exactly how something works you are much more likely to be able to diagnose why it’s not working. First, the obvious. Are there any connection faults on it? Wires can come loose, or overheat and burn. A lack of power, neutral return, an open circuit coil, or even the door latch not properly activating an otherwise perfectly functioning interlock can all cause faults. The coil can go open circuit or it can develop mechanical faults preventing its proper operation. Poor connections or burned wires are common. If wires are burned and have gone discoloured or hard they need stripping back to good wire and new connectors fitting. Also replace the interlock because it will have overheated connections inside too. In order to operate, the door interlock needs the door catch to click firmly in place. If the door catch has broken, come loose, or the door isn’t closing properly it won’t operate the interlock. It’s always worth spraying the inside of the interlock and door catch with WD40, it costs nothing and you never know. After the door interlock has been activated and the door locks shut, other faults could stop the washing machine from doing anything. For example, (This is a possibility but much more rare) if the common wire at the back of the door interlock has a break in it somewhere or faulty connection where it connects to other parts of the machine so the power passing through the interlock cannot reach its intended destination . The door may well lock, but this only shows that the lock is working. It doesn’t prove that the connection inside the lock is passing power on, nor does it prove that the wire used to pass power on is connected properly. A fault inside the main PCB, or even an open circuit motor or heating element on some washing machines can result (bizarrely) in the door lock activating and locking with displays and lights coming on but washer will not do anything at all. Some Hotpoint and Indesit machines have this anomaly. The most common type by far is the simple bi metal device described above, usually with three wires (see photo). They differ in size, shape and colour – see 4Washerhelp spare parts Door interlocks section so see what they look like (or buy). The three wires are normally, the main live supply, a neutral return for the coil which heats up the bi metal strip, and the third wire is used to carry the electricity from the door interlock once it’s been activated across to the rest of the machine. Thanks for that Andy – I had always assumed the door lock was far more complicated than this, but have never had one go seriously wrong, so had never bothered to take one apart to find out. My misunderstanding is now de-bunked so if I ever do have one apparently faulty, I will know what to look out for! Am currentley having a lock issues with an Indesit machine (iwde 126). Couple of months ago, It burnt out the cables at the rear of the lock and the lock mechinism was replaced and wires striped back and good connections made. Yesterday the cables burnt again and though this time the lock was ok, so stripped back cables and reconnected. Though now for some reason now the lock section works fine but any washing program the machine just fills and then unloads water constantly, but all the drying programs all work fine? Has the lock issue damaged the pcb do you think? Or even damaged a sensor? Hi Tracey, the door catch shouldn’t be broken or loose. They normally have a spring on them, which forces the door catch in one direction, but allows the catch to be moved in the opposite direction against the spring. If the door catch feels strong and you can push it back against the spring which then returns to position when you let go and it isn’t broken, or the door hasn’t dropped so that it’s totally out of line, then it should be activating the interlock when the door is closed. If it appears to be okay then the fault may be on the door interlock, but as my article explains, there are other possible causes. If, after checking the door catch and reading my article you cannot see anything obvious it’s best to call in an engineer. Mike, F06 is listed as “not used” on my Indesit error code lists. Will the door open with the machine switched off or unplugged? Hello Rosie, that’s one of the problems this article is designed to help with. All I can say is that all of my thoughts and advice are within the article. It explains how the door interlock works and how it recognises when the door is shut as well as which parts are responsible for activating it. All of this is necessary in order to try and diagnose a fault. Unfortunately it’s not a case of being able to say that if the door closes but the light lights up saying the door is not closed it must be caused by one fault. It could be caused by various things which need diagnosing by process of elimination. Hi Andy got a Hotpoint Aquarius + WMF760 washing machine that started the wash process okay but then I noticed it was making a clicking noise and when I went to investigate, all lights were flashing on the front – one said “door”. I have turned it off and on with no luck and then left it off for a while to pull itself together but sadly to no avail so now I have clothes trapped in my machine. When it was flashing it was also making a clicking and the kitchen lights were flickering along with it. Any advise would be wonderful? Helen, I have an article for washing Machine Door Will Not Open but if all lights are flashing it is best to get it looked at. Hi Andy, is it possible to link out the switch in order to properly diagnose whether it is the switch or not. As there are 3 wires I have concluded that two or them bring power and need to link to the third via the bi metallic strip, if all 3 are connected would that activate the washing machine ? Hello duncan. I’m very cautious about advising people to bypass the door interlock as getting the wires wrong could blow the pcb and potentially write off the machine. Also, bypassing one and leaving it bypassed would leave the machine in a dangerous condition where it may be possible to open the door whilst it’s full of water or spinning. If you can identify the wires accurately as described on my article and know that there is just a live, neutral and common then one could be temporarily bypassed to see if the machine powers up. However, connecting neutral and common will result in nothing happening and connecting live and neutral will blow it up. Also, if the door interlock connections are all inside a plug (as opposed to how they used to be with one connection each) then it would be very difficult to by-pass. Hello Lindsay, you need to determine if the light only comes on when the door is closed properly or not. If it does, and it’s playing up as you describe then there may well be something wrong with the door interlock or the doors ability to activate the interlock. If the light isn’t affected by the door then the fault is possibly somewhere else. Try switching the machine on, and when you can get the light to come on just open the door and see if it goes out. If it does then the fault may well be to do with the door interlock. Regarding the access, you need to make totally sure the washing machine is disconnected from the mains because there is a live wire directly connected to the door interlock. Unpeeling the door seal from the door frame should allow some access. Also you obviously need to take the top off. But if in any doubt you should get an engineer in. Hi my washing machine door wont lock. All the lights are on. The light for the lock is saying unlocked. The door closes fine and I can move the thing it catches to on the machine. Ive taken the socket out of the wall left it for a while then plugged back in but still wont lock. Could you give any advise please? Hello Rebecca. Possibilities are either the door isn’t activating the interlock, or the interlock is faulty. There’s also a possibility of a wiring problem. The only thing I can advise is that if this article doesn’t help you need an engineer. dear Andy, my washer stopped working. no electrics displayed. i have changed the fuse and it still does not work. i have plugged my iron into the socket and it works so it is not the socket. Is it worth paying for an engineer or will i still need a new washer? I have a Zanussi compact washing machine, about ten years old now. The door lock this morning won’t open. We have finally managed to get the top off but still can’t pop the lock open. Any ideas would be welcome. Our mischievous springer spaniel ate her way into the washer dryer and managed to bite the wires out of the door lock?!? I’ve got a new lock and have taken off the old one but as the wires were torn out of the old one I’ve no idea which colour out of the three: red, green, and white, go into which of the connectors numbered 1, 3, and 2. My machine is a Hoover vh w654d-80. Any help would be much appreciated as I’ve searched you tube but all the videos show an intact wiring block. Hello Jonathan. Unfortunately wiring diagrams are not commonly available apart from to the trade and to be honest many people in the trade don’t even bother with them because you very seldom need a wiring diagram to repair washing machines any more. My article above describes how to work out which wire goes where but you need a certain amount of knowledge and a continuity test meter to work it out. If you are very lucky someone somewhere may have the wiring diagram but if you can’t work it out yourself that is your only hope as opposed to getting out an engineer. Clearly you can’t guess because it may short out the whole machine. It’s very lucky the dog didn’t electrocute itself. Hi, my door wont close and lock Reading ur previous comments I think the door has dropped and so the latch ia not in the right position to activate the door lock. What do I need to do to the door to get it back in the right position? If the door has dropped it’s most likely wear in the door itself where it attaches to the hinge as it’s usually plastic. If the door hinge is broken or somehow bent though that would also account for it. The door would need removing to inspect everything.